I don’t see those who are being suppressed remaining in those shackles for the remainder of history. There are relatively recent times in history that can still inspire and help us recall the impact women have when united in a cause. Beginning in 1848 the worldwide women’s rights movement eventually included forty-three different countries. 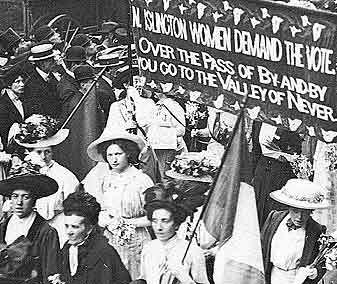 The basic rally was for women to be given the equalities of men. Groups were fighting for different laws to be changed within the cultural boundaries of their country, but the bottom line was – and still is, that women demand more respect. The two major players on the stage of change for women were known as the Suffragist and the Suffragettes. These two fractions of the whole succeeded in supporting each other to victory. Some would argue that women, even in developed countries, still have a long way to go before the male/female playing field is completely level. Nonetheless, the women who initially marched for our rights got the needed momentum going. Both groups were passionate about their cause however, the Suffragist were more militant about getting their message heard. By today’s standards obstructing traffic and heckling wouldn’t be considered assaultive but in the early 1900s, it got you thrown in jail. Naturally, there’s more to the story, but whatever these women faced, it took courage. Headquartered in Great Britain the founder of women’s rights was a gentleman named John Stuart Mill. Mill presented the idea of women suffrage on a bill he presented to the British electorate. Widely embraced by the female population, it gained a gradual male supporting as well. Its crescendo in passing several new rights for women and in a life-long voice that will never be silenced again. British women won the right to vote, to a better-earning wage, the right to be heard in political campaigns, the ability to hold public office, the right to a higher education. More verbal in its demonstration than violent the leaders of the American chapter were not to be messed with either. The drive and force of the movement took on such momentum because women realized their power. They knew in numbers they could influence the destiny of their country. Organized marches of thousands without any concern for weather showed the rest of the public as well as elected officials that they were not backing down. There is so much written on the Suffrage Movement that I encourage women everywhere to learn more. It’s history that belongs to all of us. Even to women who are yet to live in freedom, this is a legacy which has legs. What do you want to share about the women’s rights movement in your community or country? Leave a comment below.